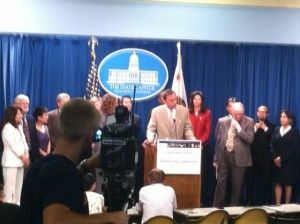 During its press conference Friday announcing the release of redistricting maps, the Citizens Redistricting Commission evaded tough questions and refused to explain why one commissioner, Michael Ward of Fullerton, voted earlier in the day against moving all of the final maps to the public for review. Ward made it clear to CalWatchdog that he stands by such concerns and is waiting to see how the process proceeds. The commission will vote to adopt what they call “preliminary final maps” in an Aug. 15 meeting. Other commissioners who spoke said that the commission has exhausted its public review process and will indeed vote to approve the new district lines for U.S. Congress, state Senate, Assembly and Board of Equalization. As the commission explains on its Web site, “In November 2008, California voters authorized the creation of the Citizens Redistricting Commission when they passed the Voters FIRST Act, which appeared as Proposition 11. Prior to 2008, California legislators drew the districts.” The goal was to take partisanship out of the redistricting process, yet the new commissioners have been dogged by allegations of inappropriate political activism and conflicts of interest. Hrabe also revealed that “a second member … , Jeanne Raya, failed to disclose financial contributions made within the past 18 months to a state political campaign committee . …” Somehow, a commission designed to be nonpartisan and charged with designing fair election districts, allowed left-wing political activists with an apparent political agenda to be among its members and to allegedly use the process to create districts that favor their political outlooks. 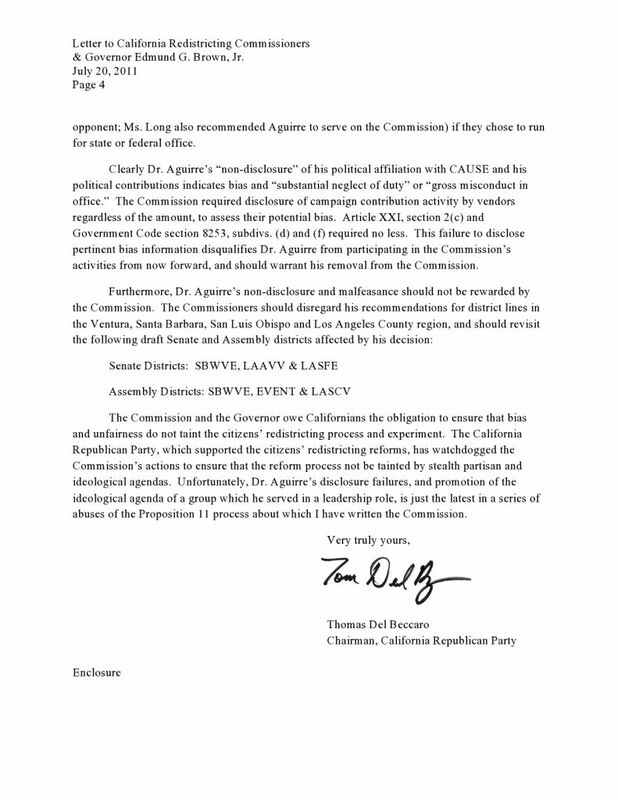 Based on the CalWatchdog revelations, California Republican Party Chairman Tom Del Beccaro called on Aguirre to resign from the post for what he termed “gross misconduct in office.” Del Beccaro questioned the fairness of a commission that failed to disclose the political activism of its members. When one reported asked about allegations of impropriety by Aguirre, Galambos Malloy said, “All of our commissioners have conducted themselves with the utmost integrity and impartiality.” They did not address any of the specific concerns raised by the news reports and by the Republican leadership. The commission also has been criticized by minority activist groups for not putting together enough Latino-dominant districts and not paying sufficient attention to African-American “communities of interest,” even though the commission must legally follow the federal Voting Rights Act, which dictates rules that enhance minority voting power. At the press conference, commissioners refused to answer tough questions and focused mainly on their own sacrifices. “If anything was sacrificed in the process, it was our personal lives,” said Michelle DiGuilio of Stockton, referring to the long hours and the time spent away from her children. Vincent Barabba of Santa Cruz added that the rewards were worth the sacrifice and told a touching story about the way that Californians have embraced their diversity. But when it came to questions about dissent, they kept repeating the mantra about this being an open and transparent process. It seemed more like a photo op than an opportunity to provide details about the inner workings of a commission that has much to say about the future politics of this state. Jon Fleischman, publisher of the conservative Flashreport, argued Friday morning that the “The commission is likely to spend a good portion of today patting themselves on the back for a job well done. They certainly do deserve credit for spending as much time as they did on this project over the past eight months . … However, the process was not a smooth one at all.” Fleischman points to self-interested agendas of commission members, unclear handling of Voting Rights Act rules and cast doubts on the much-touted openness of the process. Commissioners seem to be gearing up for legal challenges and public scrutiny, and those surely will come in the ensuing weeks. 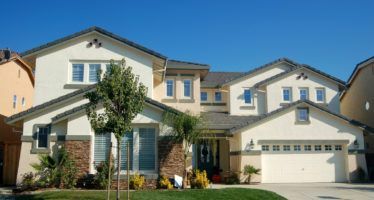 Barabba argued that if the lines are that bad, then Californians can challenge them through the state Supreme Court or can launch a referendum drive. Those challenges surely are coming, and it will be interesting to hear what Ward has to say as redistricting critics get into gear. I applied to be on the commission, but backed out when the forms required information about my relatives which I just could not disclose (employer, address, and so forth). None are in politics in any way. It is amazing to me that these people who did not disclose important facts are not headed to jail. Having read the documents they sent, it was obvious that it was stacked to the Democrats from the beginning, with all of the baloney about “community” and such. The Republican Party, unless is has become completely useless in California, musst file suit to stop this Democrat map, and must spend advertising money to make people aware of the corruption.